Mulching is particularly important in northern New Mexico because of our dry climate and intense sunlight. Made from a variety plant materials, mulches provide a protective covering for the soil around trees, shrubs and in flower beds that helps moderate seasonal temperature extremes. More importantly they reduce water loss due to evaporation. Other benefits of mulching include reducing weeds, adding valuable organic matter back into the soil, and creating a better growing environment for roots. For best results, maintain mulch at the depths recommended on the package. Water the trees or plants before mulching. 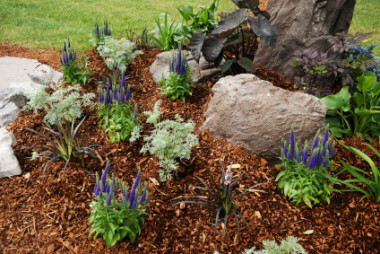 The fresh mulch will keep the soil moist and immediately begin helping prevent evaporation. Keep mulches from 4 to 6 inches away from tree trunks and other plants to prevent bark or stem damage. Using a gentle spray setting on hose nozzle to water in the mulch after spreading.